Footballers don’t have the best reputation out there. I say that whilst watching Luis Suarez clearly handle the ball in the process of scoring against Mansfield Town, prompting even the commentator on ESPN to remark “Once a cheat…” . Whilst a star at one club will be idolised by his own fans (in most instances – even some Liverpool fans are embarrassed by his antics now, ditto Balotelli at Man City), anyone outside of that bubble will need no invitation to abuse or ridicule a player should any misfortune befall him. The irony of this is that most of the abusers, if they saw one of these players, would fall over themselves to get an autograph or a photo with him (assuming they are wearing the “right” brand, of course). And of course you have the whole international parody where a player from your biggest rival can be a star one day wearing his national colours, but the biggest villain the next when he returns to club duties. Few players are genuinely loathed universally. I’m not sure there is an El Hadj Diouf or Robbie Savage fan club anywhere, unless of course they created it himself. I do not think there is anything he could do which will put him in a good light so late in his career. The toxic twins are still loved down at The Bridge but for how much longer? Both have shown over the years their repugnant side, preferring to live their lives on the front rather than the back pages. Over New Year Rio Ferdinand tweeted to his 3.7 million followers that we should feel sorry for him spending the night alone in a hotel room in preparation for a Premier League game, whilst the rest of the world was out partying. Was that a sensible move? Of course not. Someone who earns five times the average annual salary IN A WEEK is in no position to ask for pity in such a circumstance. Misguided Rio and only fuels the fire of people who believe there is an us and them culture between players and fans. Few players genuinely want to be around fans. Once the first big pay cheque arrives, the camouflaged Bentley is ordered and the mansion shaped like a Nike logo is built in Essex, they want a new set of friends, normally blonde, with significant amounts of silicon already built in. Fans are an annoyance. I’ve seen in first hand from my travels with England, where fans who have spent thousands getting to the likes of Tel Aviv, Baku and Skopje have been contained in remote car parks at airports just so they cannot “bother” the players as they leave. But surely the Non Leagues are different? Surely these are all good guys, right? Well on the whole most of the people I have met in my capacity as a fan and a club official are good people. They play football for the love of the amateur game and not because they believe football owes them anything. Fair assessment? Most players and managers will socialise in the bar after the game, even happily putting their hand in their pockets to buy complete strangers a drink (thumbs up to Thurrock management team for that gesture last Saturday). If they are not playing they will readily come to games and stand with the travelling support. Autographs and photos? No problems, irrespective of what brand you are wearing But occasionally Non League football gets it wrong. Player, managers and even directors sometimes let greed and personal vanity get in the way of the best interests of the going concern of a football club. We all know that times are tough, and every football club needs to fight for every penny, yet still there are some who have unrealistic expectations and their actions put the very survival of clubs at jeopardy. Why do they do it? Probably because after all the outgoing show of love and affection for a club and its fans, deep down they are frustrated wannabe professional players, managers and directors who feel Non League football actually does owe them something. Lewes’s visitors for Saturday afternoon’s game were Hampton & Richmond Borough, a club I’ve enjoyed visiting over a number of years. When previous manager, ex-West Ham United legend Alan Devonshire was in charge, he would be in the bar after the game, happily talking about the glory days to anyone who asked. Under his stewardship the club rose to the second step in Non League football, a mighty achievement. Last season they lost their fight against relegation, which for us Lewes fans wasn’t a bad thing as we’ve always enjoyed playing the Beavers. But after a good start to the season, with a decent squad including an ex-Lewes “marquee” player, Gary Holloway, recent form has been poor. One win from their previous six games, including a home defeat to bottom of the table Carshalton Athletic (with Holloway missing a last minute penalty), sparked an unusual response from the board. In a public statement published on their website they said:- “Whilst we still support Mark Harper and the players and believe that they can turn the current slump round we expect to see an immediate improvement over the next three league games as they are crucial for the club in achieving our aims this season and Mark has been informed of our expectations of both him and the squad .We are constantly monitoring performances and results and will make whatever decisions we believe are in the best interest of the club in order to fulfil our ambitions for the season.” So game one saw a draw against Kingstonian. Game two was against Lewes. Reading the literal meaning of their statement, a draw would be an improvement for them, but would it be enough for Harper? Or would the knee jerk upwards? After the warm up act down the road at the Amex, we arrived at The Dripping Pan just in time to grab a Pint of Best, a home-made Chilli Beef Pastie and sign SuperHans up as our first Belgian owner. Lewes 2 Hampton & Richmond Borough 2 – The Dripping Pan – Saturday 5th January 2012 Twenty minutes after the end of this tie I sat upstairs in the office as I normally do, talking through the game with Manager Simon Wormull and his assistant Nick Brown. It is always useful to get their view on how things went, and vice-versa from the terrace view. A draw was a fair result against a team who had looked at one stage like they would run away with it. Worms had started the game at left-back, due to the injury problems. I asked him about the second Hampton goal, which had been headed home by Jo Turner. “It was my fault, but when have you ever known me to jump to head the ball?” And that is the honesty that rarely exists in any level of football. That goal had put Hampton & Richmond 2-1 up just before half time, a fully deserved goal based on the dominance of the visitors in the first period. Lewes had started brightly, although it was a patched up side thanks to injuries and sickness. In the 19th minute those 550-odd souls in the ground witnessed some sheer magic. 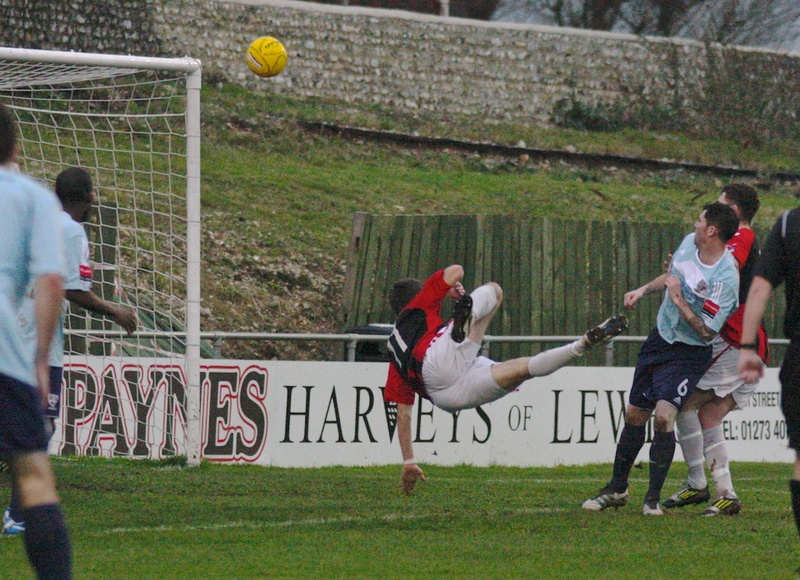 A flowing move that started with an interception in the Lewes penalty area saw the ball quickly played between half of the team before Crabb somehow got a cross in from the dead ball line and it bounced up kindly for Steve Brinkhurst who jumped and perfected an overhead kick that looped into the net (see Boysie’s excellent picture of the moment here). We all jumped around like loons, having witnessed on of the best goals that had graced The Pan for sometime. Alas, the feel good factor didn’t last too long as ex-Rooks full back Marvin Kamara fell over an outstretched Simon Wormull leg and Charlie Moone dispatched the penalty. After a panic at half time when I realised I had thrown away my winning golden goal ticket, we expected the visitors to kick on and over run the heavy legs of the Rooks. Whilst most clubs in the division had been affected by the weather in the past ten days, Lewes had managed four league games, with a thin squad. Their sterling efforts were now beginning to catch up with them. But for some reason Hampton didn’t regain any of the fluidity of the first half. Holloway, perhaps subdued by the stick he was getting from the home crowd about his 8 months at Lewes without once kicking a ball. The Rooks looked more dangerous as the half progressed and it was no surprise when Layton Schaaf equalised after some good approach play from Jack Walder. So honours even once again with Hampton & Richmond Borough. Whilst the point didn’t really help in our push for a play off spot, Lewes once again stepped up against a team at the top of the table. We never know what goes on behind all of the closed doors in football but it is a shame to sometimes see the Corinthian spirit forgotten in the pursuit of ultimately flawed dreams. But then again, that’s just football.